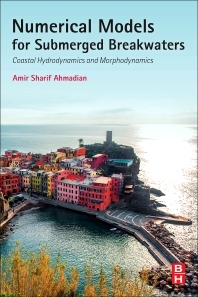 Numerical Models for Submerged Breakwaters: Coastal Hydrodynamics and Morphodynamics discusses the practice of submerged breakwaters, an increasingly popular tool used as a coastal defense system because of their amenity and aesthetics as compared to common emerged beach protection measures. The book is the perfect guide for experienced professionals who wish to keep abreast of the latest best practices or those who are entering the field and need a reference, explaining new and traditional numerical methodologies for designing submerged breakwaters and measuring their performance. In addition, the book provides case studies, examples, and practical methods for data selection and pre-processing, model setup, calibration, and analysis. Amir Sharif Ahmadian has over 10 years of experience in creating and using application of different numerical methods in coastal and ocean engineering. Along with R.R. Simons, he is the co-author of “A 3D numerical model of nearshore wave field behind submerged breakwaters”, published in Volume 83 of Coastal Engineering (January 2014).